William Faulkner wrote, “The past is never dead. It’s not even past.”1 His comments felt particularly relevant as we grappled with the history of slavery at Davidson College. In spring 2017, we approached this topic in a class focused on the study of women in the United States until 1870, HIS 306. A commitment to connecting our analysis of the scholarly literature about women and gender to our lives led us to choose a collection in our college archives as the basis of our class project. These eight letters, written by Mary Lacy, the wife of Rev. Drury Lacy, the president of Davidson College from 1855 until 1860, challenged us to use historical analysis to frame current events and to tell honest stories about our past, especially when those stories are painful. This portrait of Mary Lacy is the only image of her owned by Davidson College. It hangs in the Davidsoniana Room of the E.H. Little Library. At Hampden-Sydney, Mary met a widower, Drury Lacy, whose father also had served as a previous president of Hampden-Sydney College and who was alum of the school and Union Theological Seminary. His first wife had died of tuberculosis, and Lacy, then serving as pastor of the Presbyterian church in Raleigh, North Carolina, had six living children. Three of them were under ten years old. In 1849, Mary and Drury married. She was thirty-three years old. He was forty-seven. Mary committed herself to raising her husband’s children, running his household, and supporting his career. The Lacy family lived in Raleigh until Drury was appointed to the presidency of Davidson College in 1855. 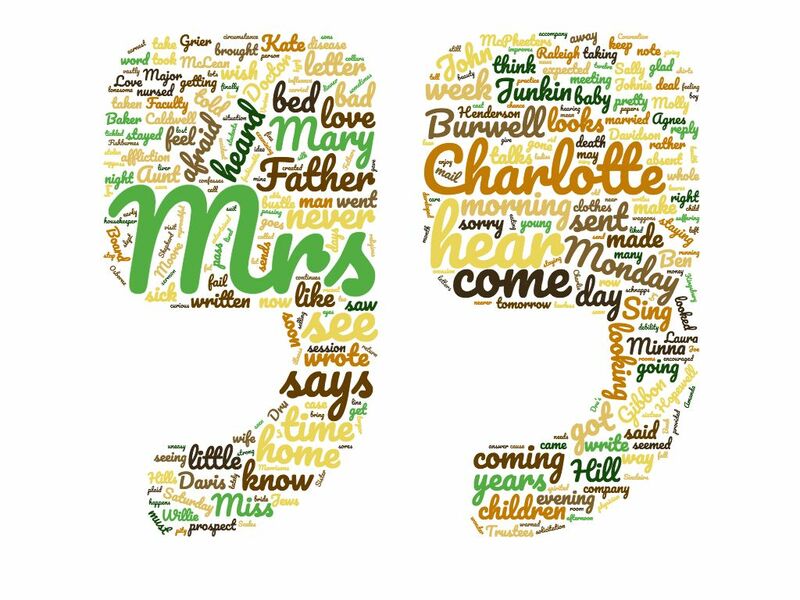 This word cloud highlights text referring to Lacy’s social network, those to whom she is writing, referring, or wishes would visit. By Kenzie Potter and Lucy Prothero. Female loved ones expressed particular concern during times of pregnancy, childbirth, and infancy. Decades before the medicalization of pregnancy, which resulted in most women having babies in hospitals, social childbirth remained the norm, and female friends and relatives commonly visited during confinements (the weeks immediately preceding and following birth) in order to care for loved ones’ children and households.6 When Mary moved to Davidson, her daughter Agnes, born in 1852, was three years old, and Benjamin was one. She gave birth to one child while living here; John Holt Lacy was born in 1856. Her step-daughter, Bess, to whom these letters were addressed, gave birth to two daughters, Mary and Bessie, during the period in which these letters were written. Her comments about her own occasional ill health (Mary seemed to suffer from anxiety) and concern for that of members of her household, extended family, and community serve as reminders of the intimate relationship Americans had with death in the nineteenth century. The loss of children, in particular, was common. One of Mary’s step-sons, James, died at the age of eight, in 1852. The support of other women was one salve for such suffering. In the antebellum South, white women like Mary and Bess also shared the management of enslaved laborers, considered part of their household resources. The centrality of slave labor to the Lacy and Dewey households is a main theme of these letters. Mary’s words also make clear that other female people – women and girls – were primarily the ones exploited. Challenging the stereotype that slavery was predominantly the experience of male field hands in the deep South of the cotton kingdom, Mary’s letters remind us of the reality that the majority of slaves did not live on large plantations but in predominantly white households and communities in which they worked in close proximity with their white owners. In the Lacy home, that meant performing the domestic labor that sustained a growing family, caring for faculty boarders, and providing hospitality to guests of the college. We invite the Davidson College community to explore the contents of this blog in the following order. Begin with our contextual essays written to provide insight and a framework for comprehension of the letters. You can find these under the tab “Analyzing the Letters.” Next, read the letters and our annotations, which were written to focus attention on the themes emphasized in our essays and provide clarity about the topics and people mentioned. We want others to read these letters because we recognize that an honest conversation about the history of slavery at Davidson College is ethically right and also necessary for the well-being of all members of our community today. In September 2016, Keith Lamont Scott, an African American man, was shot by a Charlotte-Mecklenburg police officer. Official reports, which are disputed, explain that Scott had a gun. Many Davidson students participated in the protests that followed the shooting, and students affiliated with Black Lives Matter spoke out on campus. In public events and one-on-one conversations with their professors and friends, African American students shared experiences of feeling chronically dehumanized, frightened, and unsafe here. Some white students in this class questioned whether they (and perhaps other members of the Davidson College community) had chosen to ignore this pain until we couldn’t any longer. A lack of information about slavery on campus suggests an institutional choice — conscious or not — to avoid this topic, an ignorance that individuals perpetuate. 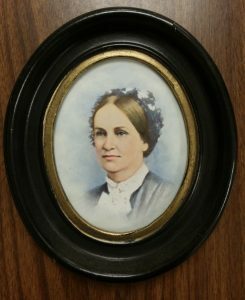 With hearts and eyes and opened by the events of fall 2016, we read Mary’s words written in February 1859 about an incident following a break-in on campus during which a student’s clothing and money was stolen. A mob of students, faculty, and community members – ostensibly in search of the thief – failed to find the person responsible but instead harassed and whipped slaves, including one who had a gun, a violation of North Carolina law. Mary hoped that these lynchings would “strike terror into the negroes.” It saddens us to know that this legacy of violence against African American people continues today and that it hurts people in our own community. The following students (some now alum) contributed to this project: Carlina Green, Kate Donahoo, Mary Beth Moore, Kenzie Potter, Lucy Prothero, Ellen Spearing, Scott Stegall, Mary Walters, and Sarah Zeszotarski. The Department of History and the office of Academic Affairs provided financial support for student research. The staff of the Davidson College Archives welcomed and facilitated our work. Instructional Designer Daniel Lynds made us web-ready. Prof. Stremlau thanks them all.